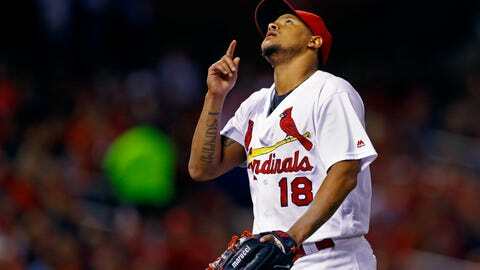 Carlos Martinez is the recipient of a five-year, $51 million deal. In the final days of negotiations, the biggest thing standing in the way of the St. Louis Cardinals signing pitcher Carlos Martinez to a long-term deal was a few hundred miles of ocean. “It’s not easy to get in touch at sea,” general manager John Mozeliak explained. But once Martinez had wrapped up the team’s annual Caribbean cruise over the weekend, the two sides were able to put the finishing touches on a record-breaking deal. During a news conference Thursday, the Cardinals announced their five-year pact with the talented young right-hander that includes a pair of club options that could keep him in St. Louis through the 2023 season. The contract is worth $51 million and includes a $4.5 million bonus and salary this season and $11.5 million each of the next four years, a person familiar with the deal told The Associated Press. The person spoke on condition of anonymity because the terms were not disclosed. The options are for $17 million in 2022 and $18 million the following year with a $500,000 buyout, potentially taking the total value of the contract to $85.5 million. The contract breaks the record for a pitcher reaching arbitration for the first time, surpassing the five-year, $38.5 million deal that the Indians signed with Corey Kluber in 2015. The 25-year-old Martinez made his big-league debut with St. Louis in 2013, but he really broke onto the national scene two years ago, when he went 14-7 with a 3.01 ERA and was voted an All-Star. He followed up with a 16-9 record and a 3.04 ERA in 31 starts last season. The Cardinals were prepared to take Martinez to an arbitration hearing scheduled for next week after failing to reach a one-year deal. They had offered $3.9 million and the pitcher’s representatives filed for $4.25 million, a gap that meant the sides were at least close to a deal. But they never stopped discussing a long-term solution, even when Martinez departed for a week at sea, and the final bits of the negotiation came into focus Monday. The deal leaves pitcher Michael Wacha as the Cardinals’ only unsigned arbitration-eligible player. Mozeliak said the contract with Martinez helped to turn around a difficult week for the franchise, which had its top two picks in this year’s amateur draft given to Houston on Monday along with $2 million in fines as compensation for hacking the Astros’ email system and scouting database. Baseball Commissioner Rob Manfred also banned former St. Louis executive Christopher Correa for life in the unusual case of cybercrime. Correa is already serving a 46-month prison term.